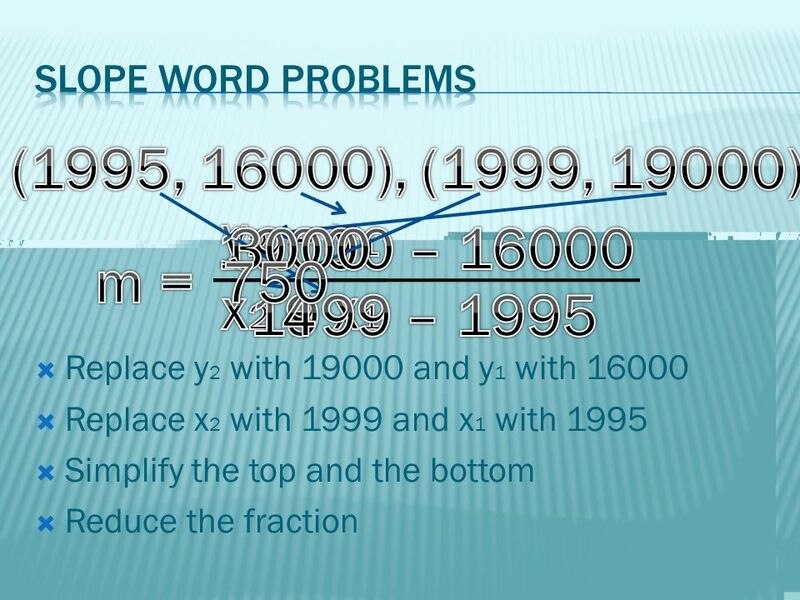  Lesson Objective: 4.01a  Students will know how to solve word problems using slope. 3  In 2005, Joe planted a tree that was 3 feet tall. In 2010, the tree was 13 feet tall. 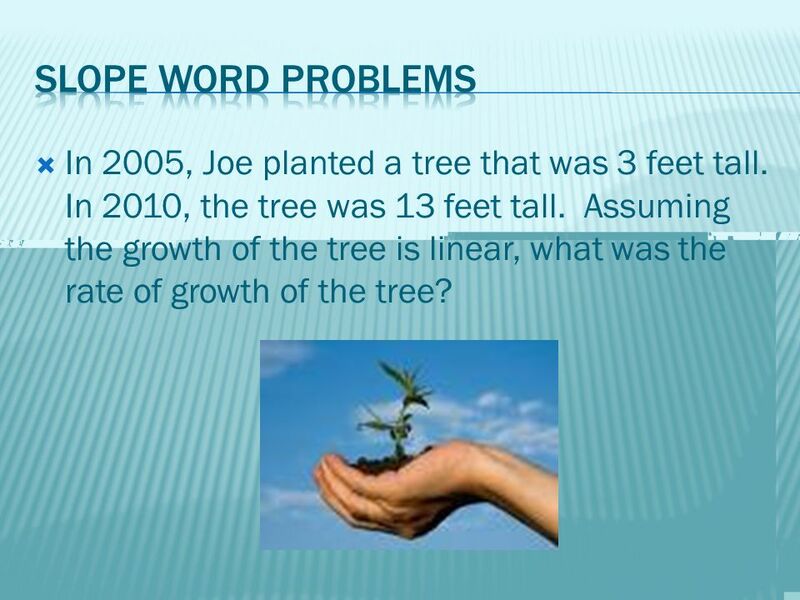 Assuming the growth of the tree is linear, what was the rate of growth of the tree? 4  What does “rate of growth” mean?  Slope! 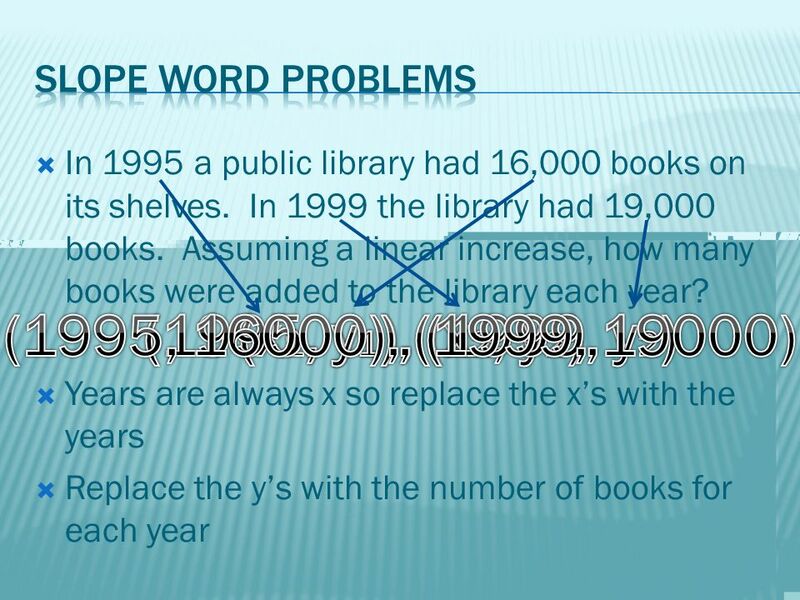 10  In 1995 a public library had 16,000 books on its shelves. 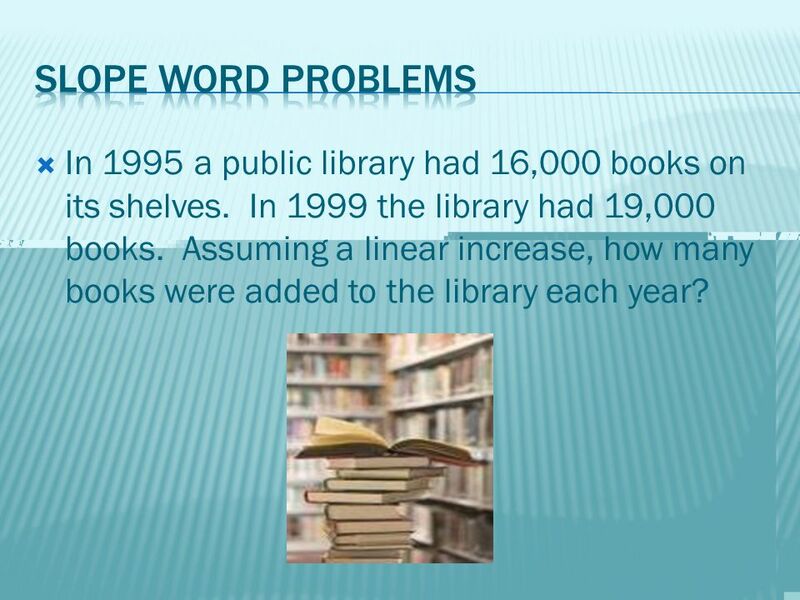 In 1999 the library had 19,000 books. 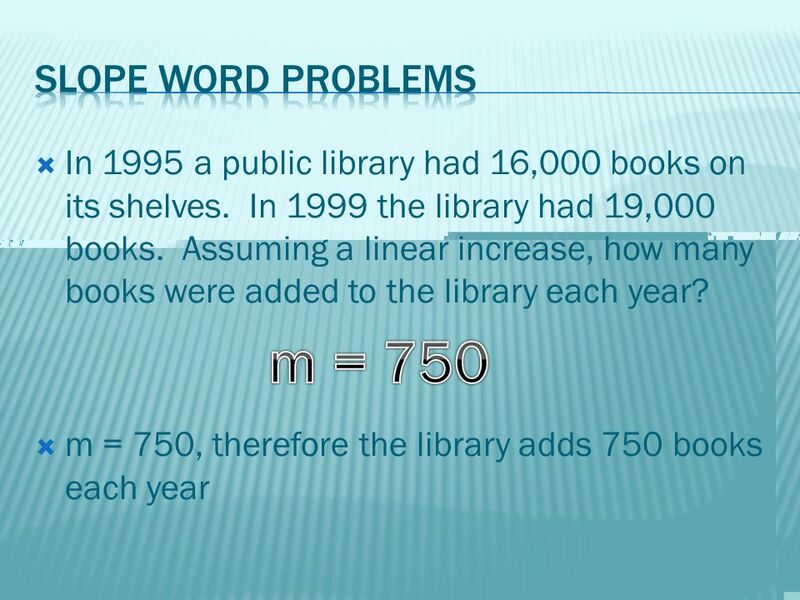 Assuming a linear increase, how many books were added to the library each year? 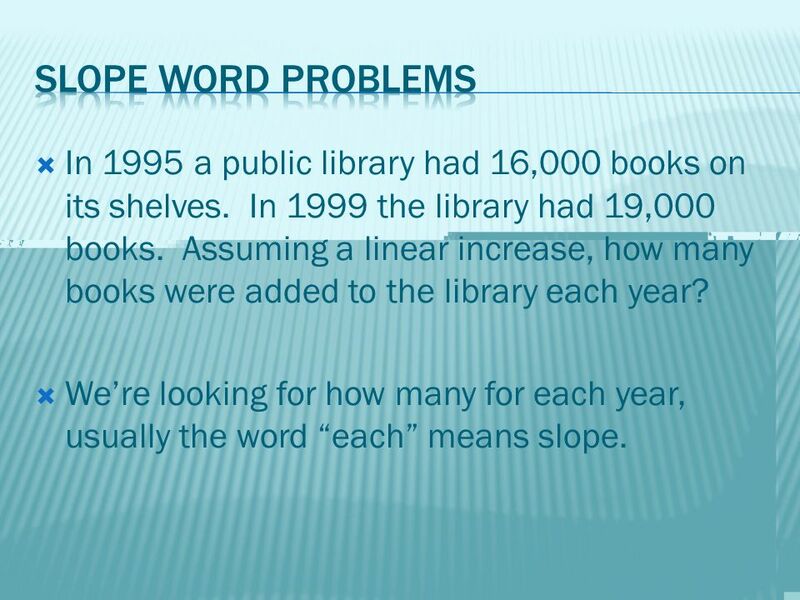 11  We’re looking for how many for each year, usually the word “each” means slope. 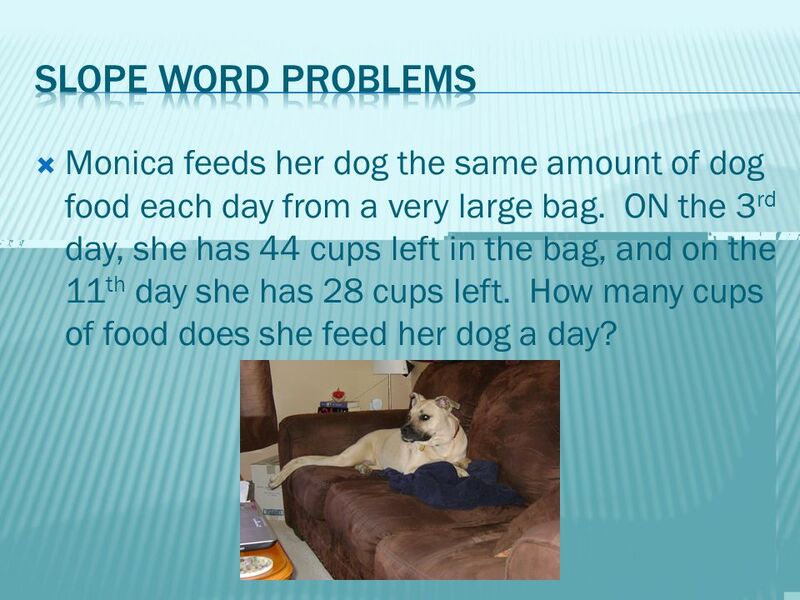 15  Monica feeds her dog the same amount of dog food each day from a very large bag. ON the 3 rd day, she has 44 cups left in the bag, and on the 11 th day she has 28 cups left. How many cups of food does she feed her dog a day? 16  Wendy bought a car for $25,000 and its value depreciated linearly. After 3 years the value was $21,250. What was the amount of yearly depreciation? 17  Jamal’s parents give him $20 to spend at camp. 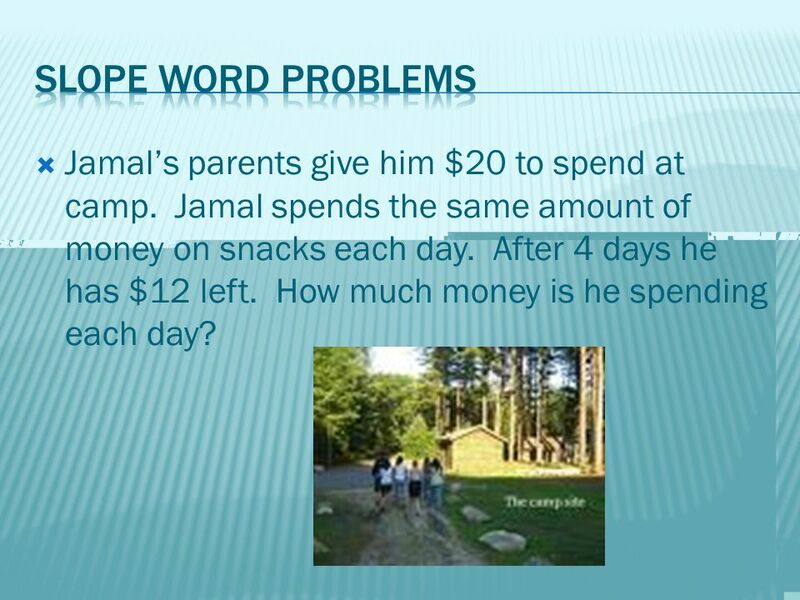 Jamal spends the same amount of money on snacks each day. After 4 days he has $12 left. How much money is he spending each day? 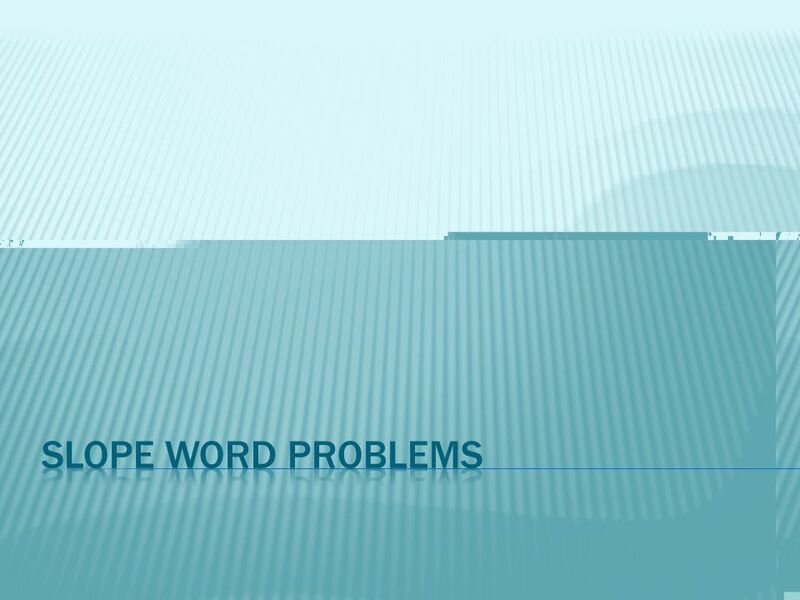 Download ppt " Lesson Objective: 4.01a  Students will know how to solve word problems using slope." 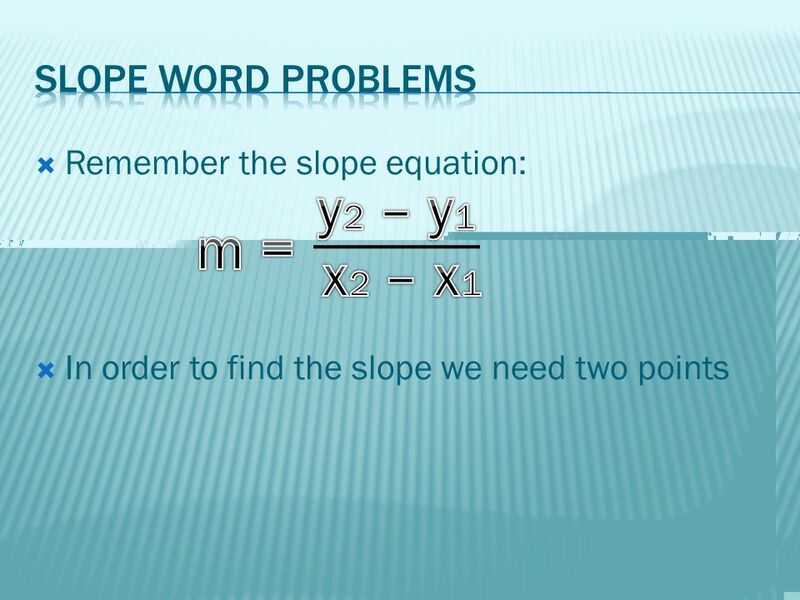 Write an equation in slope- intercept form  The slope-intercept equation is also referred to as linear equation,linear model or function. Lesson 3-4 Example Example 1 At 5 years old, Victoria was 44 inches tall. At 9 years old, she was 55 inches tall. What is the percent of change in. Chapter 4.7: Graphing a Line using Slope-Intercept, Part 1. Fraction Word Problems M/J Math 1 EETT Lesson #6.  Lesson Objective: NCSCOS 4.01 – Students will know how to solve problems using direct variation. Fraction Word Problems. 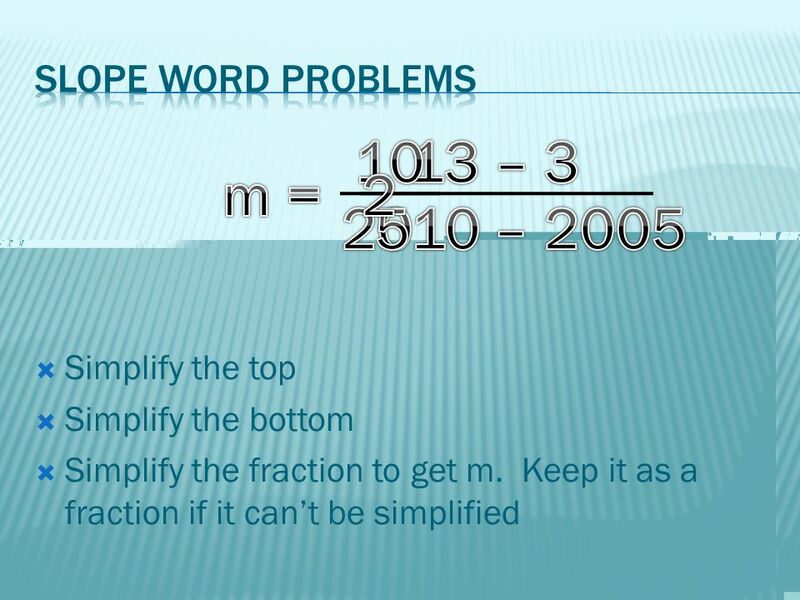 When reading word problems containing fractions, certain phrases can indicate the operation that you need to do in order to solve. Solving Systems Using Elimination. Elimination When neither equation is in the slope- intercept form (y =), you can solve the system using elimination. Learn to solve multi-step equations. Pre-Algebra 3.6 Solving Equations with Rational Numbers. Work Backwards MA.7.A Explain when you would use the work backwards strategy to solve a problem. 1.Describe how to solve a problem by working backwards. 01/05/11 Fraction and Decimal Equations Today’s Plan: -Fraction and Decimal Equations -Assignment Learning Target: -I can solve fraction and decimal equations.